It's time for another room evolution. We are stepping over from the breakfast room into the great room and I have some photos from before blogging, too for this one so you can see what it looked like in the beginning. These photos of old photos are all I have of the way the great room looked when we moved in. The sofa and rocker were in our old home in our finished basement. The walls in here were a mauve color and there was wall to wall carpet. All the trim, bookcases and mantel were a bright white. Our trim is still that same color. The bookcases and mantel have been painted since then. A couple years later the sofa and rocker were replaced with some leather/suede type furniture until we finally bought the furniture I have now in 2001. The leather furniture was poor quality and had to go. This is what the great room looked like the first time I shared it on my blog in February 2010. The mauve walls were long gone and we had hardwood flooring put in throughout the first floor except in the master. I actually liked the sofa facing the fireplace, but the room flows better in the arrangement it is now. The new red chenille sofa, chair and leather chair are all by Sherrill furniture and really good quality. The sofa just may be gone come 2016. I am over the red chenille after fourteen years and ready for neutral and a different style. In the spring of 2010 I got a wild hair and covered the red sofa and red chair with loose fit Pottery Barn slipcovers. They did not stay on long. This is when I was perusing blogs and saw all these slipcovers, but it just wasn't me. I ended up giving the slips to my sister. In May 2010 hubby a.k.a. handy man fixed a problem we had with the chimney wall from the beginning. The wall had a noticeable curve where the ceiling and wall met and it bugged him more than me so he added some trim to hide it. It's fun looking back because I thought he did this a couple years ago. Didn't know it had been so long. Time flies so fast. Next change was the mantel. I decided to paint it and the first time it was very dark. It was decorated for fall at the time and goodness gracious look at those stuffed bookcases. Ugh! November 2010 I swapped the sofa table with this chest for a new look. Just moving furniture from one room to another or in a different configuration is an easy way to refresh a room and doesn't cost a thing. The mantel had been painted with Annie Sloan chalk paint in Coco some time before this last transformation in 2012 where I aged it a bit more. I could not find the post of the transformation before this one. I know this isn't everybody's thing, but this new rack of antlers was added above the mantel in 2012. This wall has changed many times over the years just by swapping out the furniture and chairs. August 2013 I revealed the new lighter and less yellow wall color Manchester Tan by Benjamin Moore. This made a huge difference to me. After painting the walls I decided to paint the coffee table. December 2013 I bought myself a new chandelier for Christmas to replace the ceiling fan that we did not use. January 2014 I moved this antique sideboard from the foyer to this wall and it is still there. Can you believe it? April 2014 this ottoman replaced the coffee table and since has been swapped back out with the coffee table again. The ottoman is in the sun room. Last August I decided to bring this sofa table back in and shared how we added some height to it. Of course there have been many vignettes and pillow changes over and over. This is the room today. Hope y'all are enjoying looking back at these. Love the post. You have motivated me to do some looking back at pics. It's interesting the style phases/likes and dislikes we go through in our nests. I am always moving and rearranging things too. Ha. Is it a women's thing? Ha! Kim, I've really been enjoying the evolution of your rooms! I've seen old photos of some of my decorating and I think "What was I thinking? ", but then again what's in style dictates much of what we want to use. I get so tired of things the way they are and love making changes. Drives my husband batty sometimes. Fun seeing all of the changes! I started following you rather late, around 2013 so this is very enjoyable to see the changes. Loved seeing how your great room has changed over the years. I definitely like it the way it looks today the best. Love looking back and going down memory lane....really like seeing the room evolve...and i am sure it will never stop evolving!...Now I am sure it has been 24 hours since you took the last picture...knowing you, there is probably a little change!.. :) Love this fun series!! WOW, lots of changes to your room,. Like the color of the walls - and everything that is in there now. If your like me, you will be changing things up again. Love seeing all the changes in all your rooms... The great room looks so light and airy now. The red furniture really complements the red marble fireplace surround. You inspired me to look back at the changes in my own house over the past 5-6 years. This room has evolved so beautifully. Just loved seeing where the room started and where it is now. Isn't blogging great. We have a record of all the changes we make in our homes. LOTS of changes to your's Kim. I am very proud to say that I have actually been in that gorgeous room! I remember so many of these changes. 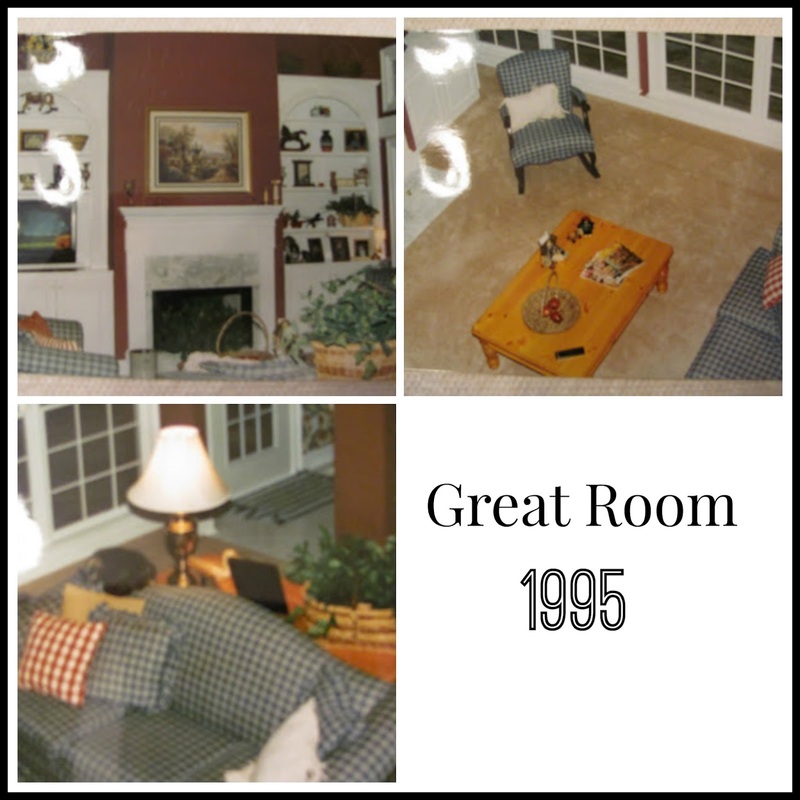 Seeing the room over the years really makes me think about moving furniture from room to room. I have only done it a few times but now you have me looking around to see what I can do around here. We recently painted our kitchen and family room Manchester Tan as well. They used to be Monroe Bisque and I am happy that the walls don't look as yellow anymore. Enjoy your weekend! Your blog is a joy for me to visit as your always in for a change! I've used Manchester tan for years now & just love the neutral warm background it provides as I too am one to change seasonally with the room decor. Evolving in our environment to what pleases us is the balance, how boring it would be for things to remain the same. Just like our seasons, each time it brings joy to see change. And some say, the only one that likes change is a baby with a wet diaper! Thank you for sharing your ever changing lifestyle through your decorating Kim, your certainly not boring & I enjoy my visiting your blog each time! I am really enjoying these evolution posts, keep them coming. It is amazing how our tastes change. When you spoke about the slipcovers: I did something similiar in that I really admired a friends home and tried like heck to copy what she did and had. BUT, it ended up, it just wasn't me. I learned that we have to live with what WE love. Have a beautiful weekend! I enjoyed this tour back to when I started reading your blog. Loved your home style then and now. You have so many lovely pieces and accessories. Wishing you a great weekend and week ahead. I have a print almost identical to the old 'peacock' print over your mantel. Do you know if it was a series or any background? I don't know anything about it. I just know I found mine at a consignment shop, but it was originally from Ethan Allen.